While BlackBerry 10 users have been quick to upgrade, the demographics of the older BBOS are mostly unchanged over the past month. OS 5.0 was first released in 2009, and still claims a decent percentage of the market share. With the release of OS 7.0 coming in 2011, even this version has been around for awhile, but has yet to even capture 50% of the market. This data was collected by BlackBerry World for downloads of the free BlackBerry strategy game Pixelated. 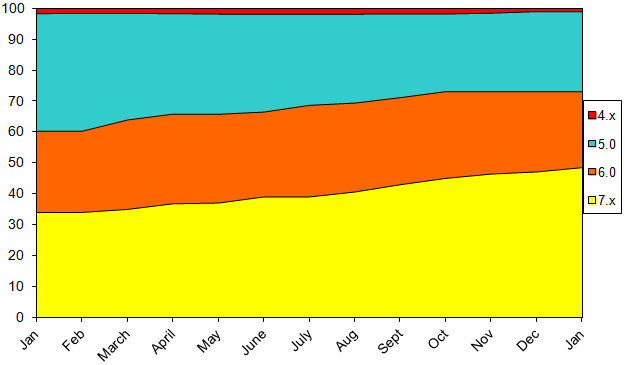 Data shown on the chart is from the beginning of January 2013 through the end of January 2014, and does not include BlackBerry 10 or PlayBook devices.